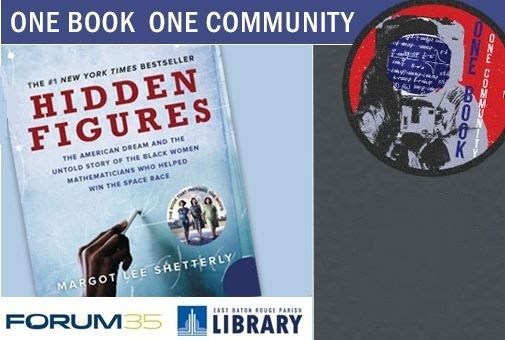 This year’s One Book One Community celebration of Hidden Figures by Margot Lee Shetterly has launched us into outer space, but the program would not be complete without a highlight on flight! The whole family can come to the Large Meeting Room of the Main Library at Goodwood, 7711 Goodwood Blvd., at 2 p.m. Sunday, April 22, for a FREE History of Flight presentation led by former ABC-TV and Radio News science correspondent Jim Slade, and Betty Geiger-Darst who will perform as Katharine Wright, the sister of aviation pioneers Wilbur and Orville Wright. The presentation will cover the achievements in aviation before, during and after the events outline in Hidden Figures. As a journalist, Jim Slade witnessed some of the truly pivotal events of this century. His coverage of the American space program began with Alan Shepherd’s launch in 1961 and continues today with the space shuttle. He has broadcast his space chronicles to millions around the world on ABC-TV and Radio, CNN, NBC Radio, Mutual Broadcasting System, the Westinghouse Broadcasting Company and the Voice of America. Performing as Katharine Wright, Betty Geiger-Darst presents a living biography and provides her audiences with a rich historical cameo of Wilbur and Orville Wright’s sister. Geiger-Darst’s interest in the Wright family was a natural extension of her exploration of the history of flight. Her research led to a relationship with the surviving Wright family and the unique opportunity to study Katharine, Orville and Wilbur through the generational tapestry of letters, diaries and family records.